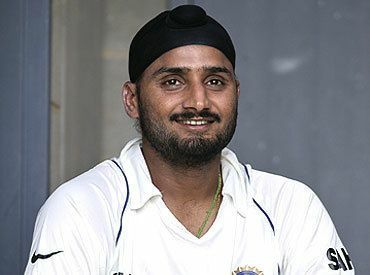 Harbhajan Singh Plaha ( pronunciation ; born 3 July 1980 in Jalandhar, Punjab, India), commonly known as Harbhajan Singh, is an Indian international cricketer and former captain of IPL team Mumbai Indians and Punjab state for the 2012–13 Ranji Trophy season. A specialist spin bowler, he has the second-highest number of Test wickets by an off spinner, behind Sri Lanka's Muttiah Muralitharan. Harbhajan made his Test and One Day International (ODI) debuts in early 1998. His career was initially affected by investigations into the legality of his bowling action, as well as several disciplinary incidents. However, in 2001, with leading leg spinner Anil Kumble injured, Harbhajan's career was resuscitated after Indian captain Sourav Ganguly called for his inclusion in the Border-Gavaskar Trophy team. In that series victory over Australia, Harbhajan established himself as the team's leading spinner by taking 32 wickets, becoming the first Indian bowler to take a hat trick in Test cricket. He is also an Officer in the Punjab Police and has held the rank of a Superintendent of police (India), reporting to Punjab Police HQ at Barnala. One of his common nicknames, outside India, is The Turbanator, deriving from his skill as a bowler in terminating the innings of the opposing team, and the fact that, as a Sikh, he wears a black turban whenever he plays. Among Indians, Harbhajan is more commonly known as bhajji. It was estimated in 2005 that Harbhajan was the most recognised and commercially viable Indian cricketer after Sachin Tendulkar, in part due to his colourful personality and iconic turban, as well as his reputation for enjoying the celebrity social scene. His signing for English county team Surrey in 2005, based at The Oval in London, was partly attributed to his marketability. Harbhajan had generated a large personal following in the western London suburb of Southall, which boasts a majority Punjabi Sikh population, when he lived there in 1998 while training under Fred Titmus. 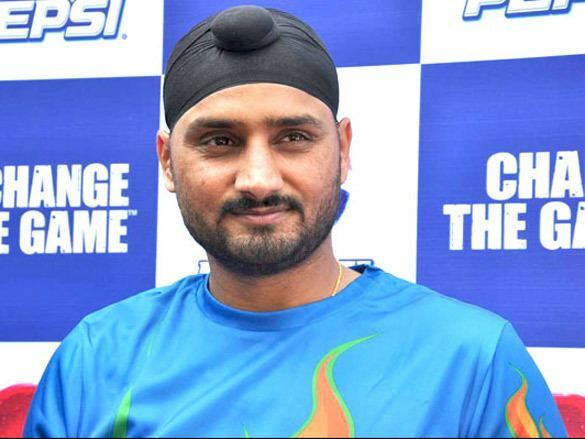 Following his run-ins with Indian cricket administrators, there was nothing to indicate that Harbhajan's chances of national selection had improved at the start of 2000–01. Despite Kumble being injured, Harbhajan was again overlooked as Kartik, Sunil Joshi, and debutant Sarandeep Singh were entrusted with the spin bowling duties in Test matches against Bangladesh and Zimbabwe on the subcontinent. Having made little success in this phase of his international career, averaging 37.75 per Test wicket to date, and overlooked by selectors, Harbhajan faced a difficult decision. His father had recently died; as the family's only son, Harbhajan was now obliged to support his mother and unmarried sisters. He contemplated quitting cricket and moving to the United States to drive trucks for a living. After being out of the team for more than 12 months, there was little overt indication of the sudden rise that would occur in his cricketing career only a few months later. With Kumble injured before the home series in March 2001 against the visiting Australians, Harbhajan, whose previous best Test figures were only 3/30, was the only capped spinner in the Indian team for the First Test. He had been recalled after captain Sourav Ganguly publicly called for his inclusion in the team. He was to lead the spin attack against an Australian team which had set a world record with 15 consecutive Test victories, and was searching for its first ever series victory on Indian soil since 1969. In a warm-up match for India A, Harbhajan had taken 2/63 and 3/81 against the tourists. Harbhajan started well in the First Test in Mumbai, taking three quick wickets in a spell of 3/8, to reduce Australia to 99/5 in response to India's first innings of 176. However, a counter-attacking 197-run partnership between Matthew Hayden and Adam Gilchrist in just 32 overs, saw Harbhajan concede 103 runs from his last 17 overs, to end with 4/121. Despite being struck for many sixes into the crowd, it was still Harbhajan's best statistical analysis at Test level. Australia eventually proceeded to a crushing 10-wicket victory, their sixteenth consecutive Test victory in succession. This test match has been called by many the greatest that has ever been played, in light of the nature of India's win under difficult circumstances. Harbhajan is considered to be one of the legends in Indian cricket. Harbhajan's Test success saw him recalled to the ODI team after more than two years. He was unable to reproduce his Test form against Australia, managing only four wickets at an average of 59.25 and economy rate of 5.04. His best performance was a 3/37 in a 118-run win in the third match, and a cameo batting performance of 46 runs from 34 balls, including three sixes, in a losing run chase in the fourth fixture. He was dropped from the ODI team during a subsequent triangular tournament in Zimbabwe in 2001 after only managing two wickets at 69.00 in four matches although he had been economical at 3.63 runs an over. Harbhajan was also unable to maintain his form in the Test series against Zimbabwe. Harbhajan began the tour well with 13 wickets in two warm-up matches, including a match haul of 10/80 against the CFX Academy, but could not repeat such performances in the Tests. He took eight wickets at 29.12 in the two-Test series, which was drawn 1–1, but did manage to post his first Test half-century, reaching 66 in the First Test in Bulawayo, before scoring 31 in the first innings of the Second Test as the Indian batsmen struggled and ceded their series lead. The Indians subsequently toured Sri Lanka in mid-2001, enjoying spinning wickets similar to those in India. Harbhajan managed to establish himself in the ODI team with eleven wickets at 21.18 at the low economy rate of 3.42 in seven matches in the ODI tournament with the hosts and New Zealand. Ironically however, his best performances, in which he conceded less than 30 runs in his ten overs three times, all ended in Indian defeats. In contrast to his ODI improvement, Harbhajan's Test form deteriorated further, yielding only four wickets at 73.00 in three Tests, while Sri Lankan spinner Muttiah Muralitharan was named man of the series with 23 wickets, in what was billed as a contest between the world's two leading off-spinners. With the Tests locked at 1–1 Harbhajan managed only 2/185 in the Third Test as the hosts accumulated 6/610 declared and won by an innings. He scored 79 runs at 15.80 for the series. At the start of the Indian season, Harbhajan took 2/32 and 4/31 as the Rest of India defeated Delhi in the Irani Trophy. This was followed by the First Test against Australia in Bangalore. Harbhajan took Ponting's wicket in taking 1/103 in the first innings, but not before the Australian captain had scored 123. In reply to Australia's 430, India were in trouble at 195/6 when Harbhajan came in to bat. He scored a rearguard 54, putting on 80 with fellow bowler Zaheer Khan, to reduce India's deficit to 70. He then took 2/76 in the second innings as the match ended in a draw. Ponting later cited Harbhajan and Zaheer's partnership as the passage of play that prevented an Australian win. In the Second Test at his home ground in Mohali, Harbhajan took 2/60 in the first innings as India took a 201-run first innings lead. In the second innings Australia were chasing 516 for victory and had started aggressively, reaching 49/0 after seven overs. Harbhajan was introduced into the attack and removed Hayden and Simon Katich in his first over and then Mike Hussey in his next. This triggered Australia's collapse to 58/5 and their eventual defeat by 320 runs. Harbhajan was unable to find a fourth wicket, which would have seen him reach 300 Test wickets on his home ground, and ended with 3/36. He was then ruled out of the drawn Third Test because of a toe injury. Harbhajan returned for the Fourth Test in Nagpur and dismissed Ponting for the tenth time in Tests in the first innings to register his 300th wicket. He ended with 3/94 as India took an 86-run lead. However, a batting collapse meant that India were 6/166 at tea on day four, only 252 runs ahead and facing possible defeat if Australia could clean up the tail quickly. Harbhajan then scored 52, combining in a 107-run partnership with captain Mahendra Singh Dhoni to guide India out of trouble. India then successfully defended the target of 380 to win by 172 runs, with Harbhajan taking 4/64 including top-scorer Hayden and the final wicket. Harbhajan was the equal-leading wicket-taker for the series along with Ishant Sharma, taking 15 wickets at 28.86. He also scored 125 runs at 41.66, helping to prevent two defeats. The series also saw the end of Harbhajan's partnership with Kumble, who missed the Second Test due to injury and then retired after suffering another wound in the next match. As a result, Harbhajan started a new pairing with leg spinner Amit Mishra. Harbhajan then missed the ODI tour of Sri Lanka at the beginning of the year with a hamstring injury. He recovered in time to be recalled for the tour of New Zealand. Harbhajan was the leading wicket-taker from both sides in both ODIs and Tests. 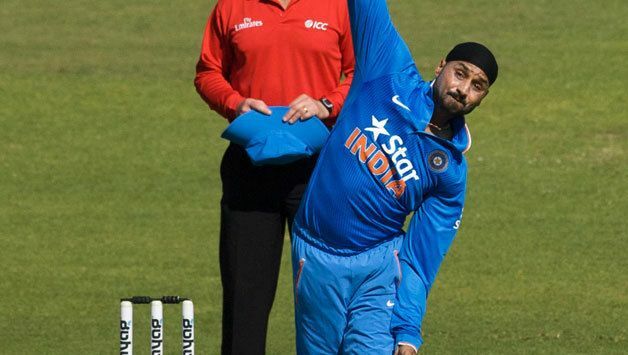 Harbhajan was India's most economical bowler in the two T20 internationals at the start of the tour, taking a total of 2/34 from eight overs and scoring 21 in the first match; the hosts prevailed in both games. In series that saw four of the five ODIs truncated by rain, Harbhajan took five wickets at 29.60 at an economy rate of 5.69. He took 3/27 in the opening match, and then took 2/56 from ten overs in the third game, in which both teams passed 330, helping India to wins in both matches. In the First Test, Harbhajan took 1/57 and 6/63 to help set up a ten-wicket win. It was only the second time that he had taken five wickets in an innings outside the subcontinent. However, he was disappointing in a high-scoring draw in the Second Test, taking 2/120 as the hosts amassed 9/619 declared. In the Third Test, India suffered a middle-order collapse on the first afternoon, and a counter-attacking 60 by Harbhajan helped them to 379. He then took 3/43 and 4/59; New Zealand had only two wickets in hand when rain caused the match to end in a draw with more than a day's playing time lost. Harbhajan ended with 16 wickets at 21.37 and 94 runs at 23.50. India won both series, their first series win in New Zealand since 1981 and 1968 for ODIs and Tests respectively. Harbhajan then played the full 2009 Indian Premier League season in South Africa, taking 12 wickets at 21.33 and an economy rate of 5.81 in 13 matches. He was one of the most economical bowlers in the competition, and took 1/9 in four overs against Punjab to win the man of the match award. He ended the season with 4/17 against Delhi, but it was not enough to prevent a four-wicket defeat. After an ordinary performance with the ball in the 5-match ODI series in West Indies in June 2011 (where he was the vice captain to skipper Suresh Raina) (took 4 wickets from 3 matches, best of 3/32), he helped his team revive from dire straits in the 1st Test in Sabina Park at Kingston, Jamaica. With India struggling at 85/6, he along with Suresh Raina initiated a counter-attack to string an aggressive 146-run partnership with Suresh Raina(82 of 115 balls, 15 fours) to help India reach 246. Harbhajan scored 70 from 74 balls (10 fours, 1 six). Following a few poor performances, Harbhajan was injured in India's tour of England in the summer/monsoon of 2011 and was ruled out of the rest of the series. He returned to competitive cricket to lead the Mumbai Indians to 2011 Champions League Twenty20 title, but fell out of favor with the national selectors. He was not chosen in the home series squad against England in October and West Indies in November and December. Mumbai Indians won their first ever championship under his captaincy, winning the Champions League by 31 runs. Harbhajan was man of the match for his contribution. 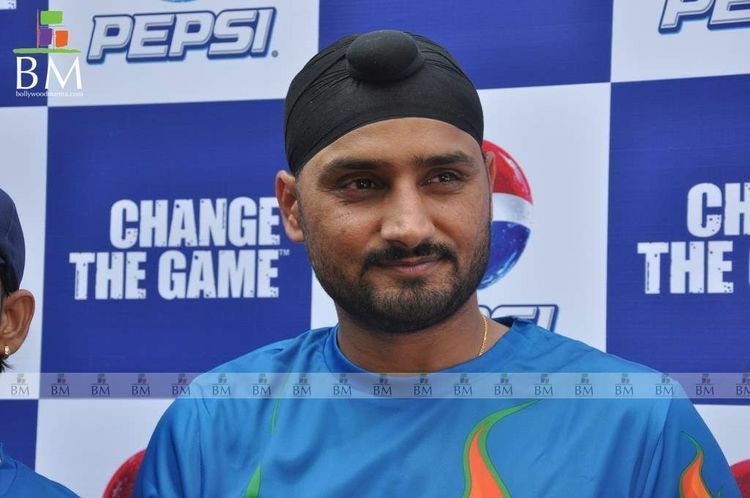 Harbhajan was also not selected for the Australian tour and the 2012 Asia Cup in Bangladesh. He went to play the IPL 2012 which was not that successful for him, but took his team to semi final while being captain. Harbhajan is now going to play for Essex in England but is not selected for the Sri Lankan tour before the 2012 ICC World Twenty20. In his debut match for Essex against Gloucestershire, Harbhajan did not take any wicket on 12 July 2012, conceding 33 runs in his 12 overs. He has, however, been included in 30 probables for the World T20 tournament being held in Sri Lanka in September 2012. He has been recalled to the Test squad after a gap of more than a year against New Zealand starting in the end of August 2012. Harbhajan was dropped from the test team after the 2013 series against Australia. He was called back to the test team after 2 years for a solitary test against Bangladesh. Following performances in IPL for Mumbai Indians in 2015 and 2014, he was included in the test team captained by Virat Kohli against Bangladesh for the one-off test match in Fatullah. He took 3 wickets in that test to overtake Wasim Akram in the list of most test match wickets to become the ninth highest wicket-taker in Tests. He was then called up for the ODI and T20I teams when a second-string Indian side toured Zimbabwe to play 3 One-day and 2 Twenty-20 matches. Though he did not take many wickets in that tour, he was impressive maintaining a tight line and stopping the flow of runs. Harbhajan returned with figures of 2/29( in 4 overs) in his first T20 international over two and a half years. He was in the squad for the 3 test away series against Sri Lanka led by Virat Kohli. He replaced injured Ashwin in series against South Africa. He was also part of the team that played 3 T20I matches against Australia, home series against Sri Lanka, Asia Cup in Bangladesh. He played only one match in the Asia Cup against UAE. He was also part of the T20 World Cup that took place in India but did not play any of the matches.